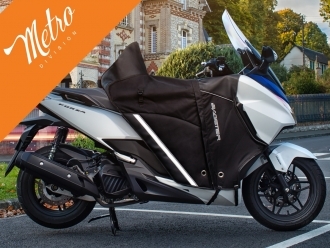 The high resistance to the bad weather and UV according leg cover 'WINZIP' is most flexible way of weather protection for a variety of scooters. 'WINZIP' use a removable fleecy lining and sidewise cover extensions with reflective piping for more safety to be a all season leg cover. Shaping and fixing points of 'WINZIP' are model-specific perfectly adapted, so you can mount and remove with a little practice in only a few minutes.